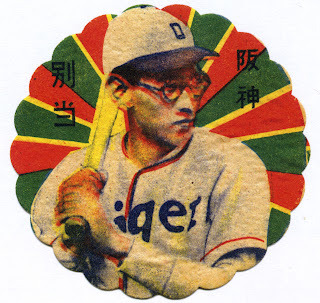 Today's fans are familiar with Japanese players coming stateside, an outgrowth of the sport's long history in Asia and MLB's willingness to scout further and further afield. It Many collectors also know this card of the first big-league Japanese player, Masanori Murakami, who debuted for San Francisco in 1964. Murakami's 12-month taste of success didn't lead to a sea change of imported players, as few teams believed Asian leagues contained enough talent to be worth scouting (and negotiating across cultures). It took 30 years for Hideo Nomo and Ichiro Suzuki to set the modern model for Japanese recruitment and several dozen players have suited for big league teams since Nomo's debut in 1995. Japan's vintage card sets predate Murakami by several decades and reflect the rapid outgrowth of baseball at the college level and its professional debut in the 1920s. 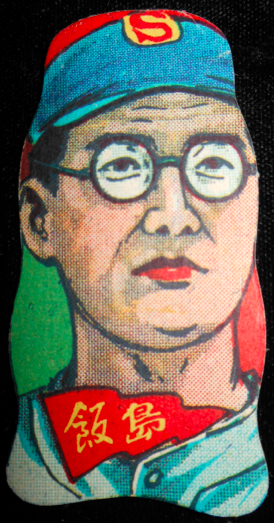 Many early sets were modeled after circular menko, a chip-tossing game; the round ones might look like Pogs to stateside collectors. Kagome made their 1948 die-cut set, cataloged as JDM4, during America's post-war occupation of Japan and their wave-edged design straddles circular menko on one side and rectangular cards on the other. 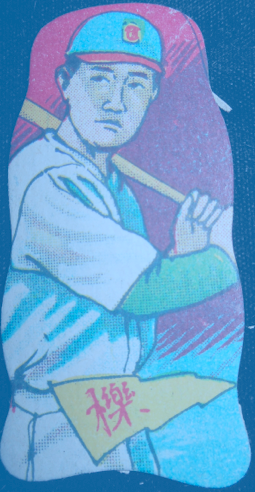 Hand-drawn and -tinted fronts show players from the revived professional league. The American occupation pushed to quickly restore Japanese college and pro leagues, in part to raise local spirits after the devastating effects of war. The tinting's a little odd on this next scan; its original coloring would look the first. Head to Rob Fitts's web site or pick up the book Sayonara Home Run! : The Art of the Japanese Baseball Card to see many more examples if you like the style. Backs show uniform number, so these guys are #5 for their respective teams. Haven't seen a full checklist online yet; Internet researchers will probably fill out vintage overseas cards as time goes on. 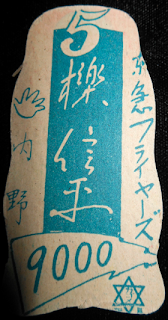 Team names run along its right edge and the six-pointed star is Kagome's logo. The spectacled guy on my first type card played for the Daiei Stars and this one suited up for the Tokyu Flyers. Both teams have since relocated (league info at Wikipedia). Value: A friend traded me these vintage types. OldCardboard estimates singles at $20 in VG condition. Fake / reprints: Haven't seen any in the marketplace. Demand would be low outside of niche collectors like me or people who specialize in overseas issues. That Murakami card is one of my personal favorites and was a key addition to my collection a few years ago. 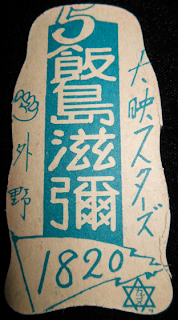 I have never seen these particular Japanese issues, but love their unique diecut shapes. I'd love to add a few of these to the collection. 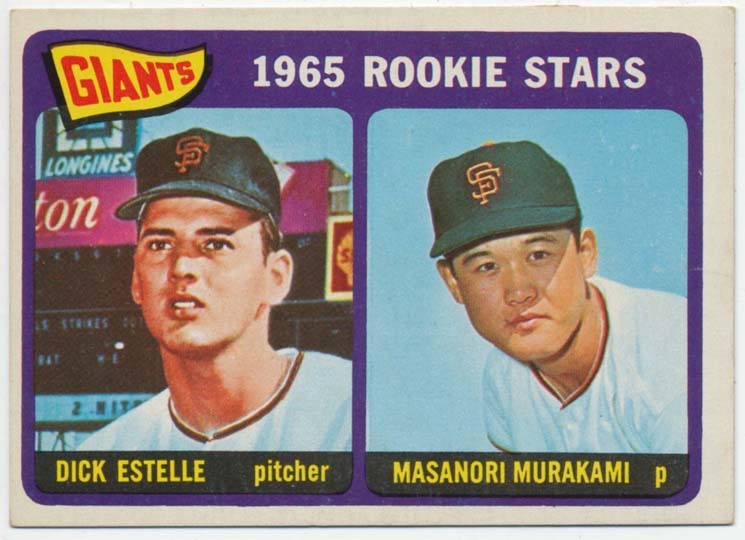 Topps reused that 1965 shot for a bunch of East/West inserts, but funny that Murakami hasn't turned up more often. 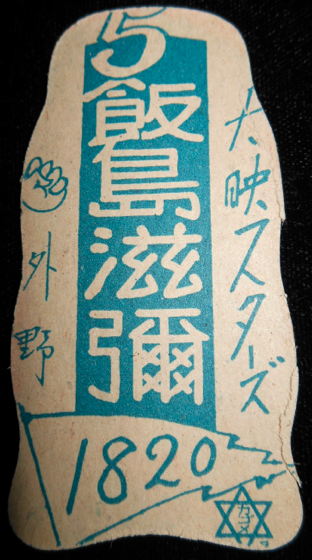 This one might be the easiest to find, other than that 1965 RC. Yeah, I remember those East/West inserts. I'm actually in the process of building that insert set and will probably just pull the trigger and pay a quarter/card from COMC. I'd love to add that Murakami to my Japanese PC... maybe I'll look into purchasing the set, since $3 for the single seems a little steep.